"Orthodox year" redirects here. For the start of the Hebrew calendar in Orthodox Judaism, see Rosh Hashanah. There are two types of feasts in the Orthodox Church calendar: fixed and movable. Fixed feasts occur on the same calendar day every year, whereas movable feasts change each year. The moveable feasts are generally relative to Pascha (Easter), and so the cycle of moveable feasts is referred to as the Paschal cycle. 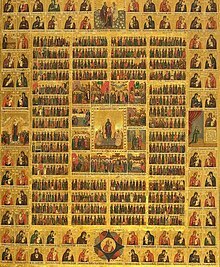 Russian icon depicting the calendar of saints (18th-19th century). The following list of dates links only to fixed feasts of the Orthodox Church. These are the fixed dates; the particular day on which that date is observed differs depending upon whether one follows the Julian Calendar (sometimes referred to as the "Old Calendar") or the Revised Julian Calendar ("New Calendar"). All dates having to do with Pascha (Easter) - the beginning of Great Lent, Ascension, Pentecost, etc. - are moveable feasts, and thus are not on this calendar (see Paschal cycle). For the day in the modern Gregorian Calendar. on which churches following the Julian Calendar celebrate any fixed date's commemoration, the 13 days which were lapsed to correct the calendar to the seasons must again lapse, by adding the 13 days to the dates below. For example, Christmas Day (December 25) on the Julian Calendar falls on January 7 of the modern Gregorian Calendar. The number of days by which the Gregorian calendar differs from the Julian calendar is currently 13, but will increase to 14 on March 1, 2100. Over the course of future centuries, the difference will continue to increase, limitlessly. For those churches which follow the Revised Julian Calendar the dates below correspond exactly to the dates on the Gregorian Calendar. The Orthodox liturgical year begins on September 1. Pascha is, by far, the most important day in the ecclesiastical year, and all other days, in one way or another, are dependent upon it. Pascha falls on different calendar dates from year to year, calculated according to a strict set of rules (see Computus for details). While the Fixed Cycle begins on September 1, the new Paschal Cycle begins on "Zaccheus Sunday" (the beginning of the preparatory season before Great Lent), eleven Sundays before Pascha, and continues until the Zaccheus Sunday of the following year. The Epistle and Gospel readings at the Divine Liturgy throughout the year are determined by the date of Pascha. In addition, the feast day of the patron saint of a parish church or monastery is counted as a Great Feast, and is celebrated with great solemnity. The season from the Sunday of the Publican and Pharisee (three weeks before the Great Lent) through Holy Saturday is called Triodion, while the season from Pascha through Pentecost is called the Pentecostarion. Because of the complexity created by the intersection of the various cycles, a number of Orthodox institutions will print an annual calendar (Russian: Spisok) which contains rubrics for the services during that particular year. Simpler wall calendars will show the major commemoration of the day together with the appointed scripture readings.